Sides will be provided for actors to read, but you may also perform a monologue if you would like. Please bring a copy of your headshot and resume with you. 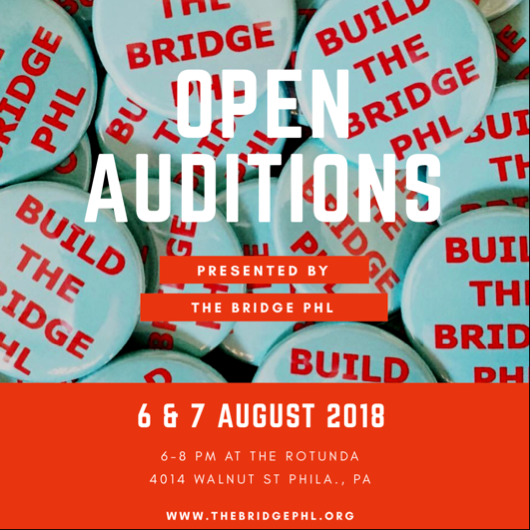 All actors must be available for The Bridge PHL Theatre Festival dates: Thursday November 1st through Sunday November 4th, as well as for tech rehearsals on Monday October 29th and Tuesday October 30th. Performance Venue: The Rotunda, 4014 Walnut Street, Philadelphia. Each play is 15 minutes or less, and rehearsal schedules will be set by each play’s individual director. Please choose the day you plan to attend. Please include your past theatre experience (i.e. shows, role, venue, director and date) or copy and paste your experience or resume here.